Draft: 2010, Detroit Tigers, 3rd rd. Robert Jacob Brantly… Married Milene Young (11/16/14)… Has two children: Layla (6/26/16) and Bryson (9/21/18)… Hobbies: Finishing a degree in kinesiology, spending time with family, fitness and nutrition… Signed by: Steve Payne. Began the season with Gwinnett (AAA) l Was on the DL with a hip contusion, 5/19-25 l Released by ATL on 7/14 l Signed by CLE on 7/21 and assigned to Columbus (AAA) l Played in 16 games after being signed. Started the season in Cincinnati's organization before ending with Chicago (AL)…Appeared in 14 games with the White Sox and made five starts…Also tossed one inning on the mound...Began the year with Triple-A Louisville, and hit .298 (50-for-168) over 46 games…Cincinnati released him on 6/29 and he signed a minor-league deal with Chicago that same day. ..Reported to Triple-A Charlotte and hit .286 (34-for-119) in 37 games…Combined to hit .293 (84-for-287) in 83 games at Triple-A...The White Sox selected his contract on 8/26 and he remained with the club for the remainder of the season...Tossed the ninth inning in an 11-2 loss vs. CLE on 9/7…Allowed a home run while retiring the other three batters he faced. Appeared in 14 games with the White Sox after spending most of the season in the minor leagues. Made nine starts at catcher … threw out 2-3 attempted basestealers … pitchers recorded a 3.83 ERA (37 ER/87.0 IC) when he was behind the plate. Was recalled from Class AAA Charlotte on 9/1 and made his Sox debut on 9/2 at Minnesota, striking out as a pinch hitter. Made his first start with the White Sox as the catcher on 9/6 at Kansas City … hit his first home run with the Sox on 9/8 vs. Cleveland, a three-run shot off Carlos Carrasco … recorded a RBI in back-to-back starts on 9/16 vs. Oakland and 9/19 at Cleveland. Hit .310 (63-203) with eight homers and 38 RBI in 53 games between Class AA Birmingham and Charlotte … threw out 28.8 percent (15-52) of attempted basestealers. Began the season on the disabled list (avulsion fracture in left thumb) … was sent to Birmingham on a rehabilitation assignment on 5/28, reinstated from the disabled list and optioned to the Barons on 6/1. Hit .325 (38-117) with six doubles, four home runs and 22 RBI in 30 games with the Barons … went 12-26 (.462) with seven RBI vs. left-handers before being promoted to Charlotte. Spent the entire season with Class AAA New Orleans in the Miami Marlins organization...Threw out 28.4 percent (23-81) of attempted basestealers...Hit .271 (46-170) over 45 road games, compared to .242 (47-194) in 56 games at home...Batted .284 (19-67) with 12 RBI over 18 games in April...Collected season highs with five hits and five RBI on 4/14 at Oklahoma City … recorded a season-high, 11-game hitting streak from 5/24-6/10 (.364, 16-44)...Hit .207 (18-87) with 11 RBI over his last 24 games, compared to .285 (41-144) with 11 RBI in his previous 42...Was claimed by the White Sox off waivers on 12/8. Opened season with Miami, appearing in 59 games prior to being optioned to Triple-A New Orleans on August 8. Returned to Miami on September 3, appearing in eight games to finish the season. In second game of April 23 doubleheader against Minnesota, recorded a careerbest four RBI in a 3x5 effort (2 2b). Set a career high with four hits on June 8 at Citi Field against Mets. Also, established a Club record by catching all 20 innings. According to STATS LLC, was just fifth player since 1921 to catch 20 innings and record four hits in same game. Became just third player in Marlins history to catch at least 15 innings in a game, and only player to do so twice in same season: June 8 (20) at Citi Field and April 29 (15) at Marlins Park. Other players were Gregg Zaun (17 on June 8, 1998 vs. Toronto) and Mike Redmond (15.2 on July 12, 2002 at Cubs). Came to Miami as part of midseason trade that sent RHP Anibal Sanchez and INF Omar Infante to Detroit on July 23...Began season with Double-A Erie, and in 46 games posted a .311 average (56-for-180) with 16 doubles, one triple, three homeruns and 24 RBIs...Earned promotion to Triple-A Toledo on June 6, hitting .254 (33-for-130) with four doublesand six RBIs in 36 games...Posted three-hit games in three of first seven contests against Triple-A pitching, but only tallied another four multihit games before trade...Following trade, was assigned to Triple-A New Orleans and hit .365 (19-for-52) with seven runs scored, four doubles, two home runs, 11 RBIs and 29 total bases in 14 games...Totaled at least one hit (five multihit games) in 12 of 14 games with Zephyrs prior to having contract selected by Miami on Aug. 13...Made Major League debut on Aug. 14 vs. Philadelphia, going 0-for-3...Began career with just two hits in first 17 at-bats (.118) before posting a .325 average (27-for-83) over final 26 games...Started 28 of Miami's final 46 games after having contract selected...Recorded first Major League hit on Aug. 16 at Colorado, a sixth-inning double off Adam Ottavino...First ML home run came in fifth inning on Aug. 26 at Dodger Stadium, a two-run homer off Aaron Harang...Recorded a season-best three hits on Sept. 17 vs. Atlanta...From date of his debut, .290 batting average (29-for-100) ranked sixth among National League catchers (min. 113 PA)...Had a nine-game hitting streak from Sept. 6-19, where he batted .448 (13-for-29)with four doubles, a home run, three RBIs and a .568 OBP...Streak tied Wilin Rosario for longest of season by a rookie catcher, and fell one short of tying club record for any catcher...Went down swinging just 16 times in 113 plate appearances, only recording two strikeouts in a game one time: Aug. 18 at Colorado. Selected to both the Midwest League's mid- and post-season all-star squads with West Michigan in 2011...Batted .339 (20x59) with four doubles, a home run and 12 RBI in 15 games during April...Collected a season-best four hits on July 20 versus Kane County...Hit .345 (20x58) with five doubles, a home run and six RBI in 15 games with West Michigan during July -- had hiscontract transferred from West Michigan to Single A Lakeland for the remainder of the season on July 21...Named the seventh-best prospect in the Tigers organization following the season by Baseball America...Saw action in 15 games with Salt River in the Arizona Fall League following the season, batting .388 (19x49) with fivedoubles and seven RBI. Made his professional debut with Single A West Michigan after being selected by the Tigers in the third round of theJune 2010 draft...Batted .300 (12x40) over the course of a 12-game hitting streak July 6-19...Compiled a season-best 16-game hitting streak July 23-August 14, batting .355 (22x62)...Saw action in three games with West Michigan during the Midwest League playoffs, hitting .385 (5x13)...Named the 21st-best prospect in the Tigers organization following the season by Baseball America. December 21, 2018 Philadelphia Phillies signed free agent C Rob Brantly to a minor league contract and invited him to spring training. December 21, 2018 C Rob Brantly assigned to Lehigh Valley IronPigs. 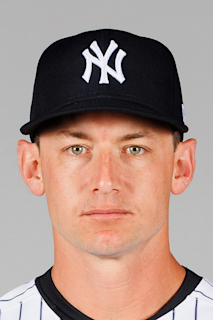 November 2, 2018 C Rob Brantly elected free agency. July 21, 2018 Cleveland Indians signed free agent C Rob Brantly to a minor league contract. July 21, 2018 C Rob Brantly assigned to Columbus Clippers. July 15, 2018 Gwinnett Stripers released C Rob Brantly. May 26, 2018 Gwinnett Stripers activated C Rob Brantly from the 7-day disabled list. May 19, 2018 Gwinnett Stripers placed C Rob Brantly on the 7-day disabled list. December 4, 2017 Atlanta Braves signed free agent C Rob Brantly to a minor league contract and invited him to spring training. December 4, 2017 C Rob Brantly assigned to Gwinnett Braves. October 9, 2017 C Rob Brantly elected free agency. October 4, 2017 Chicago White Sox sent C Rob Brantly outright to Charlotte Knights. August 26, 2017 Chicago White Sox selected the contract of C Rob Brantly from Charlotte Knights. June 29, 2017 Chicago White Sox signed free agent C Rob Brantly to a minor league contract. June 29, 2017 Louisville Bats released C Rob Brantly. June 29, 2017 C Rob Brantly assigned to Charlotte Knights. December 20, 2016 C Rob Brantly assigned to Louisville Bats. December 3, 2016 Cincinnati Reds signed free agent C Rob Brantly to a minor league contract. December 3, 2016 C Rob Brantly roster status changed by Cincinnati Reds. November 14, 2016 C Rob Brantly assigned to Gigantes del Cibao. November 7, 2016 C Rob Brantly elected free agency. August 22, 2016 Tacoma Rainiers activated C Rob Brantly from the 7-day disabled list. August 15, 2016 Tacoma Rainiers placed C Rob Brantly on the 7-day disabled list. July 1, 2016 Tacoma Rainiers activated C Rob Brantly from the temporarily inactive list. June 27, 2016 Tacoma Rainiers placed C Rob Brantly on the temporarily inactive list. April 6, 2016 Seattle Mariners sent C Rob Brantly outright to Tacoma Rainiers. April 6, 2016 Tacoma Rainiers activated C Rob Brantly. April 3, 2016 Seattle Mariners designated C Rob Brantly for assignment. March 12, 2016 Seattle Mariners claimed C Rob Brantly off waivers from Chicago White Sox. September 1, 2015 Chicago White Sox recalled C Rob Brantly from Charlotte Knights. August 3, 2015 C Rob Brantly assigned to Charlotte Knights from Birmingham Barons. June 1, 2015 Chicago White Sox optioned C Rob Brantly to Birmingham Barons. May 28, 2015 Chicago White Sox sent C Rob Brantly on a rehab assignment to Birmingham Barons. April 9, 2015 Charlotte Knights placed C Rob Brantly on the 7-day disabled list. March 27, 2015 Rob Brantly roster status changed by Chicago White Sox. December 8, 2014 Chicago White Sox claimed C Rob Brantly off waivers from Miami Marlins. September 29, 2014 Miami Marlins recalled C Rob Brantly from New Orleans Zephyrs. March 17, 2014 Miami Marlins optioned C Rob Brantly to New Orleans Zephyrs. September 3, 2013 Miami Marlins recalled Rob Brantly from New Orleans Zephyrs. August 9, 2013 Miami Marlins optioned Rob Brantly to New Orleans Zephyrs. August 13, 2012 Miami Marlins selected the contract of Rob Brantly from New Orleans Zephyrs. July 12, 2012 Rob Brantly roster status changed by Toledo Mud Hens. July 7, 2012 Toledo Mud Hens placed C Rob Brantly on the temporarily inactive list. June 6, 2012 C Rob Brantly assigned to Toledo Mud Hens from Erie SeaWolves. April 4, 2012 Rob Brantly assigned to Erie SeaWolves from Lakeland Flying Tigers. January 10, 2012 Detroit Tigers invited non-roster C Rob Brantly to spring training. October 2, 2011 C Rob Brantly assigned to Salt River Rafters. July 21, 2011 Rob Brantly assigned to Lakeland Flying Tigers from West Michigan Whitecaps. January 10, 2011 Detroit Tigers invited non-roster C Rob Brantly to spring training. June 24, 2010 Rob Brantly assigned to West Michigan Whitecaps from Detroit Tigers. June 23, 2010 Detroit Tigers signed C Rob Brantly.